Rome, often called the eternal city, speaks to the imagination: her famous and glorious history as Caput Mundi, Capital of the world during the Roman Empire, as well as her renowned demise. when the Colosseum falls, Rome will fall; when Rome falls, the whole world will fall.” This passage reveals the importance and centrality of a city in general and of a specific structure in particular. Luckily for us the Colosseum, originally called amphitreatrum Flavium, still stands and what a sight it is! Upon approaching it for the first time I tried to imagine how it would be like to enter the arena as a gladiator and hopefully depart again through the Gate of Life and not through the Gate of Death. I write extensively about the Colosseum, because the gym, Palazetto dello Sport, were we all fought, was clearly built with the Colosseum in mind. It has the same oval shape and entrances everywhere. In ancient times, these entrances were designed to structure the entry of the sometimes 60.000 spectators and to let all of them vacant the place within minutes afterwards. Up to a point the Rome Open and Europeans BJJ No-gi may have been similar to ancient times: many different people, faces, languages, gestures, but all assembled for a similar purpose, namely either to watch or to compete. To be sure, nowadays we do not fight to the death, nor are we perceived as that which is not Roman (that is to say not civilized) yet while being at the same time highly popular and venerated by countless Roman ladies. Moreover, we fight because we choose to, not because we have to and we also do not let the audience decide our faith, whether we are about to die or live to fight another day. Still, competing in this modern-Colosseum-like structure as ‘modern gladiators’ enhanced the atmosphere. 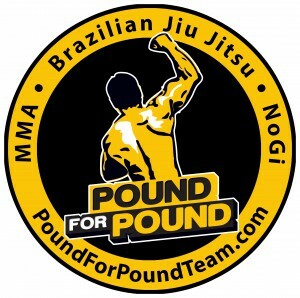 From the Pound for Pound Team, only a handful competed. For some it was their first performance in a new belt division. For others it was another important steppingstone on their BJJ journey. Our success was this time not necessarily measured in securing many medals, with the exception of our professor Sergio ‘Canudo’ Zimmermann who secured three golden medals, but to figure out were we are at in our BJJ. What are our strengths and weaknesses? Which holes do we have in our games? For me, it was being unable to escape from the lasso-guard, for another to react faster, or to make sure to stay in your game. 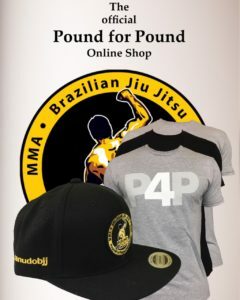 All these elements are of paramount importance to improve not only our BJJ, but also our mindset and general attitude. When it comes to showing what is possible when one keeps training, our professor Sergio ‘Canudo’ Zimmermann’s performances were revealing. He won gold in his own weight class and open class gi and became European No-gi champion in his own weight class! He tapped many of his opponents under 3 three minutes. Not because he just bulldozed them with weight and strength, on the contrary, he did it with technique, patience and precision. This you develop when you test yourself infinite times on the mats. In the end, Sergio too had to go through all the hoops we are going through now and will go through. In other words, Rome proved herself to be a stage of confrontation, change and improvement. She once again hosted a spectacle, in which the old ways have joined the new. We thank our professor and all our Pound for Pound teammates both present in Rome and at home for their support and investing in us by rolling with us. In the BJJ world there are many tournaments, but when one utters the word ‘Europeans’, everyone knows exactly about what this person is talking about. In the first month of this year (20-24th of January 2016) it was organized again. 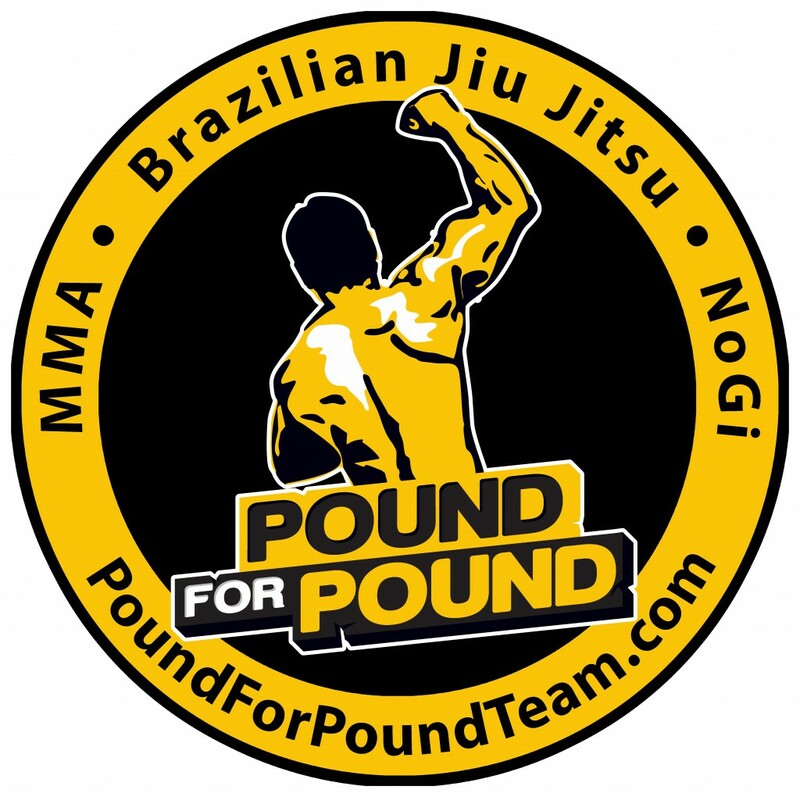 And a Team, the Pound for Pound Team, counting twenty-five fighters travelled to Portugal. They accepted the challenge to step on the mats and to test their abilities to the utmost. We did well, for not only did every Pound for Pound Team member acquire valuable experiences and gave the best they had, we also brought home 5 medals, of which one was gold (Benedikt Johannes Schotthöfer – brown belt division / master 1 / male / light) and four were bronze (Miguel Maria Ferreira Mariz Ruivo WHITE / Juvenile 1 / Male / Middle, Petrit Memeti BLUE / Master 1 / Male / Light Feather, Bruno Miguel Semedo Mendes Ferreira BLUE / Master 1 / Male / Light, Mirza Karac PURPLE / Adult / Male / Ultra Heavy). Simply an amazing feat when you take into account that one bracket could count up to sixty combatants or that the PDF file containing all the fighters was more than 80 pages long! We tend to focus on results only, because that is something tangible, something you can grab and show. But what about the intangible processes behind these results? You do not see the hardship, commitment, failures, the blood, sweat and tears that lead to success. I myself was not present during the Europeans itself, but I did witness the processes and preparation of my fellow Team members. The endless repetition and drilling; oh the single leg did not work out well enough? Then, drill longer! Thus said our professor Sergio ‘Canudo’ Zimmermann. And longer drilling they did. Eating clean, sometimes cutting weight, trying to come to training as often as possible, even though many have full time jobs and families. It is simply not that easy. For instance, because BJJ is not purely a somatic exercise, quite on the contrary, the mind is at least equally as important. The ability to move and apply techniques is one thing, but to be able to read and feel your opponent, to find the holes in his or her game and to be as swift as possible to counter react is another. The Pound for Pound Team is lucky to find such a versatile professor in Sergio ‘Canudo’ Zimmermann and to find divergent training mates who improve your game. Another interesting feature is the aftermath: behind the scenes you most likely do not know what happens after a prestigious tournament. It does not mean that it is over it just continues and is one important stepping stone on your BJJ path. You can notice the differences in those who competed immediately when they are back on their ‘own-home-mats’. It is incredible how profound the impact is and how directly it affects and improves their abilities and tactics. We are proud of our fighters and see you next time on the mats! Sunday the 21st of February was to be that day. 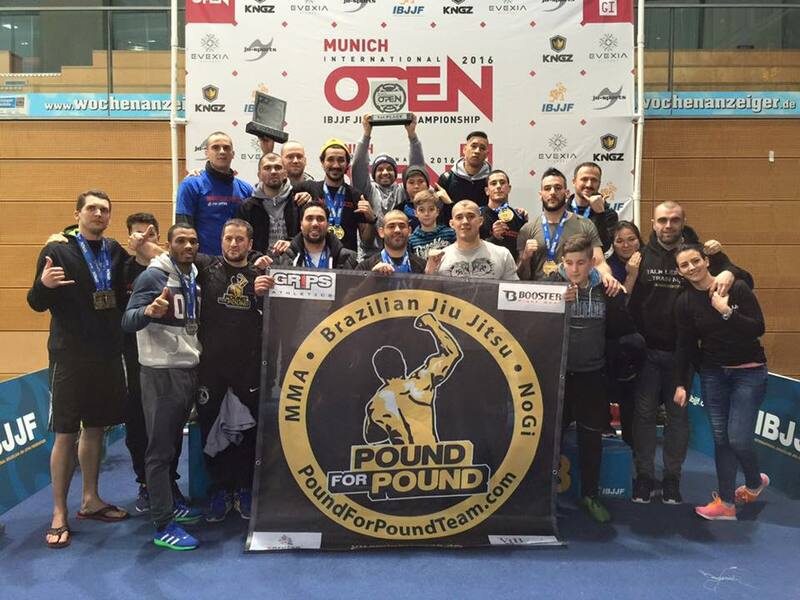 That day in TSV Unterhaching Sportarena where many of our Pound for Pound Team comrades stepped on the mats. This international Team gathered together from many corners of the world in Munich. Led by professors Sergio ‘Canudo’ Zimmermann and Fabio Fetter a Team counting more than forty combatants and supporters was ready: it was time to tackle the Munich Open. And tackling we did! We managed to not only win the Academies’ first place trophy in gi, but also the second place in no-gi with no more than six fighters. This shows more than just winning, for these results reveal the high quality of our teachers and their dedication to teaching, our commitment, endurance, eagerness to learn, will power of body and mind, technique and above all Team spirit. Ultimately, the moment when you step on the ‘competition mats’, fighting seems to be a lonely business. It is just different compared to sparring and training with your professors and Teammates whom you know and see several days a week. 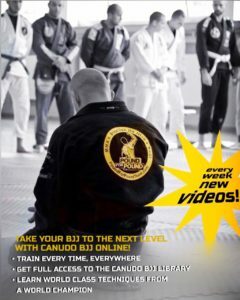 Surely, it is in your own gym, this safe environment where you spend many hours on the mats, where you learn many techniques, where you drill them endlessly, and endeavor to apply them. However, it seems to me that competition is a whole different ball game. Whereas in the gym you learn fighting skills, it is throughout tournaments that you acquire fighting skills. And that what you acquire is part of valuable experiences that simply cannot be learned. For one the pressure of facing an opponent you do not know anything about: how he or she fights, which tactics he or she uses, which techniques they prefer and so on and so forth. During a match it is just you against your opponent. It is you who moves, it is you who reacts and counter reacts to particular moves your contestant makes, it is you who makes the call to applying certain techniques, setting them up and it is you to execute them. For another, to deal with nervousness: to not get paralyzed and end up forgetting all that you have learned. To be a bit bold and to dare to take some risks and go for it. Sometimes it will work out, sometimes it will not. That is part of it, but most importantly that you know where you are at and therefore to know where you should be going. We would like to thank our professors for always being there for us on many levels; for the impeccable trainings and preparation, their guidance and trust. We would like to thank our fellow teammates as well, without you, we would not be able to learn so much and perform so well! Every single one of us contributed to these baffling results, as All Armies of One and as One Army of All. Osss!!!! Winning isn´t normal. That does´t mean there is anything wrong with winning. it just isn´t normal. it´s highly unusual. Every competition has only one winner. no matter how may people are entered, only one person or Team wins the championship. Winning is unusual – as such it requires unusual action. In order to win, you must do extraordinary things. You cannot just be one of the crowd. The crowd does´t win. You have to be willing to stand out and act differently. Your actions need to reflect Unusual values and priorities. You have to value success more than others do. You have to want it more. WANTING IT MORE IS A DECISION YOU MAKE AND ACT UPON – NOT SOME INHERENT QUALITY OR BURNING INNER DRIVE OR INSPIRATION! You have to make that value a priority. You cannot train like everyone else. You have to train more and train better. You cannot talk like everyone else. You cannot think like everyone else. You cannot be to willing to join the crowd, todo whites expected, to act in a socially accepted maker, todo what is „in“ . You need to be willing to stand out in the crowd and CONSISTENTLY take exceptional action. If you want to win, you need to accept the risks and perhaps the loneliness because ……. WINNING ISN´T NORMAL!!! Days of hard BJJ training, dedication and persistence enabled you to reach the long-awaited day. The problem about those butterflies in the stomach, nervousness and heart beating stronger is exactly when these feelings get out of control. Many BJJ champions considered themselves defeated even before they fight. Have the strong conviction that the world will be at your side while you keep yourself loyal to what is best in you.” Grandmaster Carlos Gracie Sr.
BJJ warrior, imagine yourself giving your best, see in your mind the referee raising your arm. Believe in yourself! 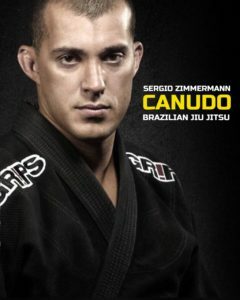 Once again we are pleased to welcome one of the best BJJ coaches currently who is coming back to Munich this weekend!!! 6th Degree Black Belt, Master Julio Cesar Pereira is the co-founder and the Headcoach of the well known and successful Bjj Team GF Team and the coach of many multiple champion including one of the best of all time, Rodolfo Vieira. This seminar is open to everyone regardless of team, belt, gender or age.